Blackcurrants are one of the easiest plants to grow from cuttings. The success rate is more than 50%, they need no protection or care when growing from cuttings and the process of cutting the stems is simple. 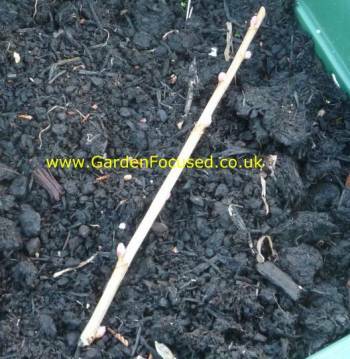 The method we describe is for hardwood cuttings which uses pencil thick, relatively hard stems. Hardwood cuttings can be grown in multipurpose compost in pots but they do best in a small patch of well dug soil which is sheltered from the worst of the winter wind. There is a best time to take hardwood cutting but any time between October to March should be OK. We suggest the best time for hardwood cuttings in your area is the third week of October. 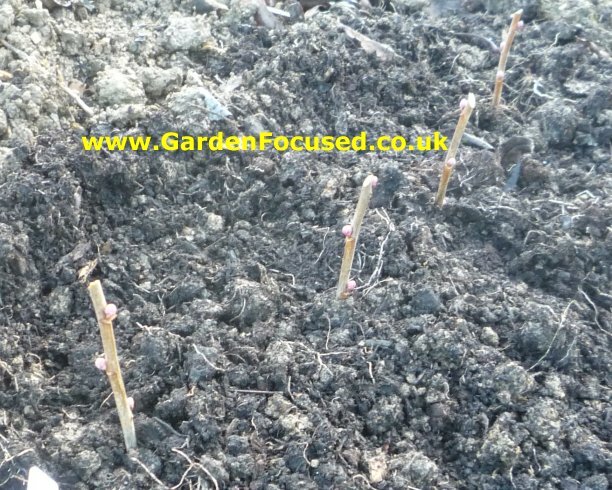 The reason for taking blackcurrant cuttings in mid autumn is that the ground is still warm enough to allow the roots to establish themselves at the expense of unwanted foliage at this time of year. 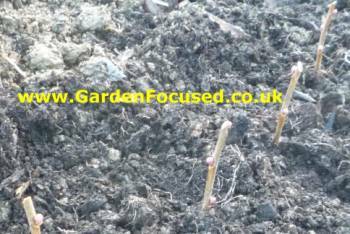 If you take cuttings in mid-winter the ground will be too cold for much root growth to occur. Cuttings taken in early spring will tend to grow foliage at the expense of roots and for cuttings, you initially want good root growth. First prepare a small patch of soil for the cuttings to grow in. Dig it well and add some well rotted compost or similar to provide good drainage. Work in a handful of blood, fish and bone fertiliser. You are looking for grey stems rather than green ones and they should be the thickness of a pencil (see the picture above). Green stems indicate that they have grown recently and may be damaged by frost when used as cuttings. The greyer stems are from growth earlier in the year which will have hardened up slightly. 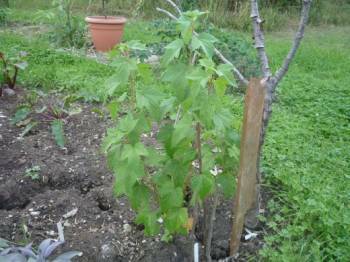 Only take cuttings from blackcurrant bushes which are in good health. Cut a 30cm / 12in stem from the main bush just below a bud. See the picture above (click it to enlarge and see more clearly). Trim off 5cm / 2in from the top end of the stem. Trim off any leaves which remain on the stem but be careful not to damage any of the buds - see picture below. Blackcurrant cuttings should be planted deeper compared to other cuttings. About two thirds of the stem should be below the soil and only a third above. Plant the stem about 15cm / 6in deep in the prepared trench firming the soil down (see picture below). Water the cuttings well. The cuttings should be left alone until early autumn the next year unless weather conditions are exceptionally dry when they may need a good watering. Even better, apply a deep mulch around the cuttings when they are first planted which will reduce the need for watering to none in most years. See the picture above for the same cuttings in August the next year. Very healthy looking plants which will be moved to their final position in a month's time. Dig up your cutting with as much of the root ball as possible. 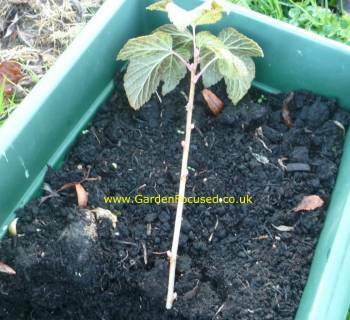 Plant your blackcurrant bush in its final growing position as described here. QUESTION: Do you need more than one black currant bush for cross pollination? ANSWER: No, a single blackcurrant bush will produce a full crop, they are self-fertile. QUESTION: I have two Ben Nevis that I got at the nursery a couple weeks ago. I have them in 15 gal pots on my balcony. In live in Minnesota USA and I plan on taking cuttings around Oct. My question: Can I take my cuttings and start them in pots indoors with my grow lights? Then in the spring plant them outside? ANSWER: I wouldn't do that. The conditions inside a heated house are not suited at all to blackcurrant bushes. The lack of cold may also stimulate the production of leaves but you really want the cutting to initially put down roots, not produce leaves. I know the climate in Minnesota gets very cold in winter but blackcurrants have in-built anti-feezeesystem which should prevent them from freezing.system which should prevent them from freezing. What you can do is take the cuttings in October as you suggest and then when the frosts start, lightly cover the cuttings in rackennor something similar. Take the bracken off in early spring when the weather begins to improve. The intention would be to protect the plant from excessive wind. If anything is going to kill a blackcurrant cutting it will the combination of wind and frost.or something similar. Take the bracken off in early spring when the weather begins to improve. The intention would be to protect the plant from excessive wind. If anything is going to kill a blackcurrant cutting it will the combination of wind and frost. When you initially plant the cuttings, make sure also that they are in a position naturally protected from wind. QUESTION: Is there any point is taking and planting cuttings this time of year before spring hits? How low does the success rate drop to at this point? ANSWER: Blackcurrant cuttings can be taken at any time of year with a high rate of success. The reason for suggesting September as a good time is that the soil will remain moist naturally from rainfall. No need to think about watering. So, if you keep the ground moist throughout the summer, taking cuttings now should be fine. QUESTION: My 3 year old has just ripped a branch off our blackcurrant bush (which is not that big!) Any tips for planting it now eg a shady spot? ANSWER: Yes, a shady spot is the best idea. Don't waterlog the ground but keep it moist for a couple of months. They root very easily and I suspect they will do so even in April. ANSWER: Your aim should be to get them planted outside in their final positions as soon as possible. Blackcurrants are very frost hardy plants - the cuttings I took in December went straight into ground and they have already begun to grow even through several degrees of frost. If your soil is frozen solid then I would put them in pots full of multi-purpose and place them in a protected position (against a house wall or a fence out of the wind is ideal). Plant them as soon as the soil can be dug. They might be OK in an unheated room by the window but I have never tried that. I would trust more to their inherent ability to withstand frost. QUESTION: I have a large number of small blackcurrants shoots that I grew from seed using last year's fruit. The shoots look quite healthy in individual pots (some in the greenhouse, others outside) and are 5-6 inches having buds developing. Can I expect to get any fruit from these in the future or am I wasting time/space/pots etc. ANSWER: You are definitely not wasting your time. They will grow well if you transplant them into the ground at this time of year. They will fruit in a year or so. The unknown is how they will turn out because they probably won't come true to type. You may get plants similar to the parents or they may be different. QUESTION: I got blackcurrant bush for last three years. I got 1 kilo of blackcurrant this year. I made a lovely jam out of it. my grandchildren love it. I want to make more blackcurrant trees. Can i cut this October? And from cuttings can i make another tree? please help me. ANSWER: As the article above says, October is a good time to take blackcurrant cuttings. Yes it will grow into another blackcurrant bush, the simple process is all outlined above and the success rate is high. Good luck.